South Carolina’s Kings Mountain Marathon & Half Marathon got its start in 2010, after severe weather prompted the cancellation of February’s Myrtle Beach Marathon that year. Stirred by the desire of a number entrants looking to complete their quest to run 50 marathons in all 50 states, the race organizers pulled this race together. The race continues for its 10th annual running this year thanks to the reception from runners in the inaugural race, who praised its peaceful natural beauty along a route that winds through both Kings Mountain State Park and Kings Mountain Military National Park, which lies adjacent to the state park and stands today as a monument to one of the most significant turning points for American victory in the Revolutionary War. Runners in the half marathon begin the race at 8:00 AM sharp in the parking lot next to Lake York inside the park, just off Camp Cherokee Road. From there, half marathoners continue north along Camp Cherokee Road before for the first two miles before turning around and heading south, this time turning right at the fork to Park Road. After turning left onto Apple Road, runners begin the longer out-and-back segment that makes up the bulk of the course, including for about a mile after leaving the southern part of the park. Runners turn around before reaching State Highway 55 and then retrace the long out-and-back route to the finish line, back near Lake York. Along the route, runners can expect plenty of rolling hills as well as variety in the terrain — some surfaces are paved, some are gravel, while others are dirt. There’s also plenty to remind you of the importance of the history that took place here more than two centuries ago, with markers and monuments to the American victory in the Battle of Kings Mountain in October 1780, which Thomas Jefferson called “the turn of the tide of success,” as it was the first major victory for American troops over the British since the invasion of Charleston, S.C., in May of that year. 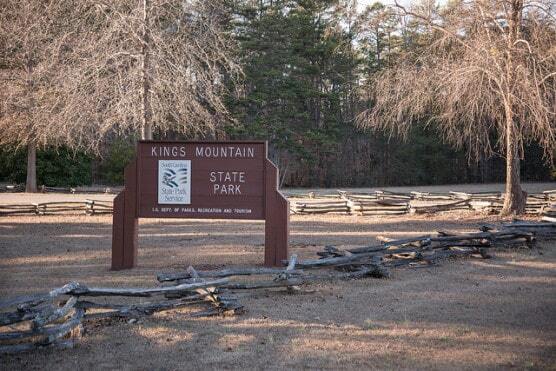 The state park, which runners trek through in the early and later stretches of the race, also offers plenty for visitors to enjoy, as it has miles of hiking and walking trails, horseback riding, campgrounds and two fishing lakes, as well as a replica of a 19th-century-era Piedmont farmhouse that was typical of those in South Carolina during that time. Located among the Piedmont region hills of upstate South Carolina, roughly 60 miles northeast of Greenville, the town of Clover typically sees mild to warm weather in April, which has brought record temperatures here as low as 18 degrees (in 1983) and as high as 92 degrees (in 1980). On race day (April 27), the average low is 47ºF and the average high is 74ºF. See the race route map for the Kings Mountain Half Marathon here. To reserve your spot in the 2019 running of Blacksburg’s Kings Mountain Marathon or Half Marathon race, register online at the event website here. Ever run in the Kings Mountain Half Marathon? Share your impressions here, or post your review in the Comments below.